You will need to use a chart from Aislinn’s pattern in order to make the cuff, or you can make your own design (her chart is free). 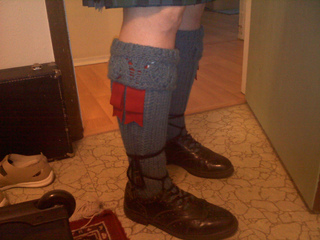 These would make nice and warm kilt socks for the colder months, or perhaps comfy slipper socks. My husband says they are comfortable to wear in shoes (he’s the model for the pictures).